The following article appeared in the Art of Manliness web site. It draws upon a book, Antifragile: Things That Gain from Disorder, by Nassim Nicholas Taleb. It has received very mixed reviews--some complementary, some not. I think there is merit to the points being made by the writers. It is lengthy, but a thought provoking read. In his book, “Antifragile: Things That Gain from Disorder,” Taleb convincingly argues that this powerful quality is essential for businesses, governments, and even individuals that wish to thrive in an increasingly complex and volatile world. If you want to succeed and dominate, to separate yourself from the pack and become the last man standing in any area of life, it’s no longer enough to bounce back from adversity and volatility–to simply be resilient. You have to bounce back stronger and better. You have to become antifragile. In his most recent book, “Antifragile,” Taleb offers some simple heuristics to help businesses and individuals thrive in a life swirling with volatility. Before he does that, though, Taleb makes the case that people/systems/organizations/things/ideas can be described in one of three ways: fragile, resilient, or antifragile. Which category best describes you? Let’s take a look at the triad. Things that are fragile break or suffer from chaos and randomness. Fragile systems/people/things seek out tranquility because they have more to lose than to gain during volatile times. Fragile people/systems/organizations are concave. 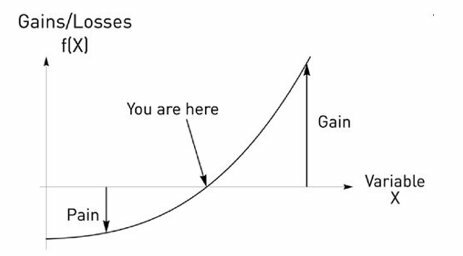 As fluctuations increase (x-axis) you experience more loss. Taleb likens the fragile to the story of the Sword of Damocles. For those of you who aren’t familiar with this Greek myth, Damocles was a courtier of King Dionysius II who greatly envied the king’s life of power and luxury. The king offers to let him try out holding the throne, so he can see for himself just how great it is. At first Damocles revels in his newfound wealth and finery and relishes having servants administer to his every need. But then Dionysus places a razor sharp sword–hanging only by a thin horse hair–directly over Damocles’ head. At any moment the hair could snap and instantly kill him. Suddenly, being king didn’t seem so great. Damocles begs Dionysius to let him leave. He realizes he doesn’t want to be as “fortunate” as the king after all. With great power and success come great peril and anxiety. As Shakespeare put it, “uneasy lies the head that wears the crown.” When you gain in status and wealth, your responsibilities increase. Mo’ money, mo’ problems. Moreover, you have to constantly be on guard for challengers who want to dethrone you. Which is why the Sword of Damocles is such a great metaphor for fragility. When you’re king or in any position of power, one small jostle could bring down your house of cards; you’re actually more fragile than you might have thought. You don’t have to be in a position of power to experience the Sword of Damocles effect in your life, though. The sword could also be something like debt. When you’re in the hole everything is hunky-dory so long as things are relatively stable, but add in a bit of volatility–you get sick or your car breaks down–and the sword falls. Fragile things are typically large. Size often offers a false sense of security, but large organizations, such as giant corporations and big governments, typically aren’t agile enough to survive, let alone thrive during times of adversity. There are too many complications and layers of bureaucratic red tape to allow for quick action. Large entities are much like the Titanic on the night that it sunk. By the time the lookouts spotted the iceberg, it was too late to take corrective action because the liner’s turning speed was so slow and the radius so wide. To successfully navigate toward a safe direction, more time was needed–and time is a luxury not often available during a crisis. Thus in stressful times, it pays to be small and agile. Responses to variability and stress come from the outside. If something is fragile and it’s exposed to stress, there’s nothing built in to help fend off that stressor. The response must come from something external to it. For example, if a porcelain teacup were to fall off a table because the table was jostled, the only thing that would prevent the teacup from breaking would be some external force or object–a hand catching it or a foam pad to blunt the impact. The same applies to people or businesses. A fragile person will likely require outside help when they hit life’s rough waters because they lack capital–be it financial, social, or emotional–to help them weather the storm. Fragile things are overly optimized. Fragile businesses, people, and organizations are often too smart for their own good. Our modern world is obsessed with efficiency and optimization. Businesses seek to crank out as many widgets as they can on tight time frames and with as little cost as possible. Similarly, individuals are told to be as efficient as they can with their time. And it works . . . if everything goes to plan. But everything rarely goes as planned. Randomness is the rule, not the exception. You sign up for a European cruise. It’s scheduled to set sail from Venice, Italy, but you live in Tulsa, Oklahoma, so you’ll have to take an international flight to catch your cruise. You optimize your itinerary for getting there with both time and money in mind–the first flight leaves late enough that you can get in a half a day of work, and you’ve minimized your layovers between connecting flights. Your efficient flight plan hinges on razor tight margins. With 30-minute layovers, you can’t have any hitches. You make your first flight with no problem, but the next flight is delayed, causing you to miss your flight to Rome, and thus your entire cruise. Because you left absolutely no time in your schedule for hiccups, your well-intended attempt at optimization turned out to be very costly. I’ve seen the problem of over-optimization in my own life with my weekly planning. I’ve often planned my week to a T, under the naïve assumption that no unforeseen tasks or distractions will come up. But of course, unplanned problems do happen, forcing me to change my schedule. Because it was so “optimized,” one change forces another, which forces another, which creates a boondoggle for me. I made my schedule fragile by trying to cram too much in. Fragile people and systems seek to eliminate variability, noise, and tension. Because fragile people and systems don’t have built-in responses to stress and variability, they naively try to eliminate it completely from the equation. But trying to eliminate randomness and variability is a loser’s game. It’s simply not possible. Remember, randomness and variability are the rule, not the exception. Not only is trying to eliminate stress and variability a lost cause, it ends up making an already fragile person or system even more fragile. Taleb calls these folks who quixotically attempt to eliminate volatility “fragilistas.” Helicopter Parents are great examples of fragilistas. In their attempt to make life as safe as possible for their children, they actually set them up for sometimes debilitating failure when they inevitably face adversity on their own. Human psyches require variability, adversity, and stress to become strong. By depriving their children of stress, Helicopter Parents “fragilize” their future. The resilient, or robust, don’t care if circumstances become volatile or disruptive (up to a point). They remain steady in times of both adversity and tranquility. Taleb likens resiliency to the mythical Phoenix. The Phoenix, if you remember, is an immortal bird that dies by fire and is reborn from its ashes to its initial state. The Phoenix doesn’t get better or worse from its cyclical death and rebirth. It just stays the same. Hence, resilient. People can be resilient when they stay cool, calm, and collected during periods of stress. Buddhism and Stoicism promote psychological resilience, as both philosophies teach indifference to change. When you’re mentally resilient, you don’t care if you’re rich or if you lose your wealth in a single day. Resilience, or robustness, is certainly more desirable than fragility. We should do all we can to make ourselves, our businesses, and our society more resilient in the face of volatility. But Taleb argues that to aim just for resilience is a “sissy” move because you’re essentially settling for the status quo. Sure, when things are resilient, you bounce back from adversity, but you just bounce back to the state you were in before the fall. To be truly effective in a world swirling with complexity, randomness, and risk, you can’t stop at sissy resilience. Whenever you can, you should always find opportunities to actually grow from disorder, volatility, and adversity. The goal should be to move beyond resilience to becoming antifragile. Things that are antifragile grow and strengthen from volatility and stress (to a point). When people or systems are antifragile, there’s more upside than downside when Black Swan events occur. Antifragile systems feed on chaos and uncertainty like a primordial god. Antifragile things are convex. As variability increases (x-axis), gains increase. Less is usually more with antifragility. To become anti-fragile, it pays to be small. With smallness comes increased agility and flexibility during volatile and chaotic times. If I were navigating a foggy sea filled with hidden icebergs, I’d rather be a passenger on a small, but maneuverable jet boat than a giant, but sluggish ocean liner. Guerilla armies and terrorist organizations are devastating examples of how less is more when it comes to antifragility. With small amounts of manpower and money, they have the ability to cripple large states, economies, and armies. What’s even scarier, the more that large nation states try to suppress these small, loosely organized terrorist organizations (a fragilista move), the stronger these organizations become. They’re the Hyrda. Responses to variability and stress are built into the antifragile. Unlike fragile things that require an outside response to protect them from variability and stress, antifragile things have strength and protection baked right in. Our skeletal system is a great example of a built-in response to variability. Our bones actually require stress in order to grow and maintain strength, which explains why competitive bicyclists have lower bone densities than non-competitive bicyclists of the same age. Riding a bike doesn’t stress the skeleton the same way that running, lifting weights, or even walking does, thus a bicyclist’s bones can become more brittle. Antifragile things have built-in redundancies. This point stuck out to me the most. Unlike fragile systems/organizations/people, antifragile things don’t make efficiency the primary goal. For the antifragile, thriving in randomness is the goal, which often requires being ?inefficient? through layering redundancies. Nature is filled with “inefficient” redundancies. Animals have two lungs, two kidneys, and two testicles, when one of each would work just fine. Since one in a pair of organs can become disabled through disease or trauma, it pays to have a spare. Besides allowing you to weather storms, Taleb argues that redundancies also allow you to become stronger. The perfect example of this is a survivalist versus a minimalist. Minimalism is aesthetically pleasing, but if the world went to pot, the guy with just 100 possessions would be screwed. The survivalist who has built-in redundancies–not just a fridge full of food but a stockpile of MREs, not just central heating but a wood burning stove, not just money but cigarettes for currency–will not only survive a disaster but thrive in it. Redundancies don’t necessarily weigh you down–in the case of the survivalist, he may be very prepared to bug-in, but he’s also ready to bug-out. Redundancies need not create the kind of lumbering largeness that can make systems so fragile either. As opposed to layers of bureaucracy, an antifragile person/organization has direct access to their capital and full control over the decision of when and where to use it. Nature and tradition do a good job of creating antifragility. As Taleb points out several times throughout Antifragile, nature has done a fantastic job implanting antifragility into organisms and systems. Our bodies have antifragility built into them in several ways. We already discussed our skeletal system’s built-in antifragility. Another example is how our body responds to fasting. When we go without food for long periods of time, our body releases hormones that actually make us stronger and mentally sharper. This antifragile response makes sense. Our caveman ancestors evolved in a time when food acquisition was scarce and random, so our bodies evolved to adapt to that environment. Taleb also makes the case that human traditions have antifragility baked into them. For us scientific moderns, many traditions seem archaic and silly. But they developed for a reason and survived for so long because they served some purpose. According to Taleb, traditions are often just time-tested heuristics that make living in a random and volatile world manageable. For example, rites of passage have been employed in cultures all over the world to enable young men to have a clear sense of when they’ve become a man and should take on grownup responsibilities, instead of letting them confusedly drift into adulthood. Through these challenging and oftentimes painful coming-of-age ceremonies, a young man emerges stronger than before. Taleb’s Antifragile has given me plenty of food for thought. I now look at everything through the lens of his triad. It’s a fascinating mental exercise organizing the world around you as fragile, resilient, or antifragile. Applying this to my own personal life has been an eye-opening experience. Where am I fragile? How can I make different areas of my life antifragile? Can I do things to help my family become antifragile? While I’ve long been a proponent of becoming psychologically resilient, I really like the idea of going a step farther ? not just staying the same during adversity, but becoming mentally stronger from it. I want to learn how I can create an environment that makes such an outcome a possibility. Intentionally inject stress in your life. Stress has gotten a bad rap; while long-term stress can have deleterious effects, short bouts of it can make you stronger and better. Your body and mind have antifragility built into them, but require stress for that antifragility to activate. A few ways to inject positive stress into your life: fast, take cold showers, do a challenging obstacle race, lift heavy weights, run instead of bike. Add redundancies in your life. Start that emergency fund; add buffers in your schedule to take into account the inevitable volatility that comes each day; make that bug-out bag. The gains from redundancies increase as volatility increases. Employ the “barbell strategy.” Taleb describes the “barbell strategy” as “a dual attitude of playing it safe in some areas and taking a lot of small risks in others, hence achieving antifragility.” Playing it safe reduces the potential downside of volatility and taking small risks exposes you to the potentially massive gains from the same chaos. For the Average Joe it could mean keeping your boring day job (the safe end of the barbell), while working on your side hustle at night (the risky end of the barbell). If the side hustle doesn’t work out, you still have your boring job, but if it does work out, you could live the dream of working for yourself and becoming wealthy. Never take advice from someone who doesn’t have “skin in the game.” We live in a world in which people’s actions, opinions, and advice are divorced from consequences. We no longer force people to have “skin in the game.” This fragilizes society. Financial advisors on TV can give terrible advice and pundits can spout off wrong opinions but suffer no consequence for their erroneous predictions, even if those predictions harm others. When determining whether or not to take advice from someone, look to see if they have skin in the game. If the person dispensing the advice or making the prediction has nothing to lose from being wrong, don’t listen to them. Pay more attention to people who have accepted risk and responsibility for their words. Practice via negativa. 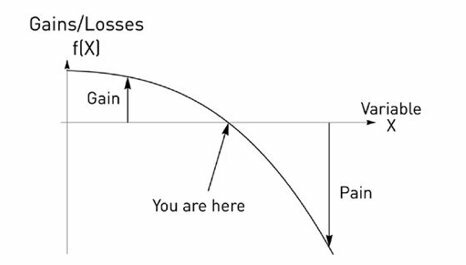 According to Taleb, “the first step towards antifragility consists in first decreasing downside.” We do that through practicing via negativa–a phrase borrowed from theology. Instead of focusing your time on adding things to your life to make it better, focus first on subtracting habits, practices, things, people that fragilize you. A few examples: get rid of debt, quit smoking, stop hanging around toxic friends, eliminate unhealthy foods. Keep your options open. Increase optionality in your life. When volatility and chaos increase, it’s the man with the most options who is the most antifragile. How do you increase optionality? Having money in the bank certainly increases your options; it gives you breathing room during economic downturns, but also provides flexibility to take advantage of positive unforeseen opportunities or to pursue goals. Increasing your skills gives you optionality as well. If one career goes bust, you have the skills to jumpstart a new one. Here’s to becoming antifragile in 2014.